A few weeks ago I spent a long weekend staying with my daughter in San Francisco, a city I hadn’t visited for a long time. 2017 is the 50th anniversary of what has come to be known as “The Summer of Love”, the ultimate flowering of the hippie movement in and around San Francisco’s Haight-Ashbury district. I wasn’t there in 1967, but I was there in the summer of 1969 and so was able to observe what was still a very active scene. On my recent visit I went to see the “Summer of Love” exhibition at the De Young museum in Golden Gate park. It brought back a lot of memories. The sights and sounds of the hippie movement were brilliantly displayed. The clothes, the fantastic poster art and the music. I walked down Haight St and tried to remember what it was like in 1969. As I remembered it, although my memory was somewhat hazy, it had been like one great party. Thousands of people pouring out of the houses into the streets all day and night, many of them completely stoned. I had been very impressed. The concerts at the Fillmore, the spontaneous “happenings”, the incredibly revolutionary and lively atmosphere were completely unique as far as I was concerned. Fig 2. 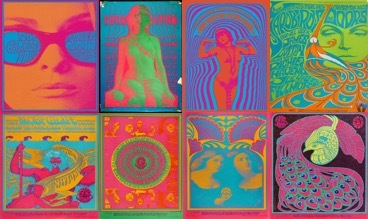 Left -1967 San Francisco concert poster. 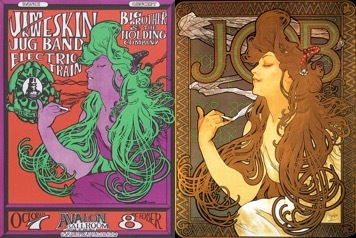 Right-1896 Parisian Art Nouveau poster by the artist Alphonse Mucha for Job cigarette papers. question was lysergic acid diethylamide (LSD). In many respects the hippie movement was an attempt to actualize the LSD experience. But how did this come about? Where did the LSD come from and why at this particular time and place? There is an interesting story to be told here. The first part of the story concerns the discovery of LSD itself (Fig. 3). Dr. Albert Hoffman synthesized LSD, a semisynthetic ergot alkaloid, in 1938 while he was working for the Sandoz drug company in Switzerland. The ergot fungus, which grows on cereal crops like rye and barley, is chock full of extremely bioactive molecules. Sandoz was really the first company to harness these substances and produce a useful drug – ergotamine, for the treatment of migraine. Launching a research program in this area was obviously a reasonable thing to do, and several other useful drugs came out of it. But LSD was something completely unexpected and, at the time, unprecedented in its effects, at least as far as most Europeans and Americans were concerned. Once the Sandoz drug company had accepted the fact that they had discovered a new drug which produced extraordinary psychological effects, they set about trying to find a niche for it in the pharmaceutical market. The first research paper describing the effects of LSD was published by the company in 1947. Sandoz then began to distribute samples of LSD, using the trade name Delysid, to psychiatrists in Europe and America. For a period of time in the 1950s LSD was a pretty hot topic in the psychiatric research community and it was employed for treating a wide variety of syndromes, including things like alcoholism, autism and several psychiatric disorders. It was also used as a therapy for helping terminal cancer patients. In many instances the drug was reported to produce promising results. Over 1000 research papers were published on the subject and it seemed as if LSD had a bright future as a useful psychotherapeutic drug. At the same time that LSD was starting to make an appearance in the research community, other events were bringing what were to become known as “psychedelic” drugs to the attention of a wider public. The term psychedelic was coined in 1956 by the English psychiatrist Humphrey Osmond who was one of the research leaders in the field. In 1955 Gordon Wasson, an American banker with a strong interest in the use of psychotropic drugs by indigenous peoples for religious purposes, made a journey to Mexico. He was one of the first people in modern times to observe the ceremonies carried out by the Mazatec Indians in which they used hallucinogenic mushrooms of the psilocybe family to enhance their religious experiences. He published his observations in a widely read article in Life magazine in 1957 entitled “Seeking the Magic Mushroom”. Wasson and his colleagues were also able to collect some of the hallucinogenic mushrooms and send them to Albert Hoffman at Sandoz who isolated their hallucinogenic principle, the molecule psilocybin. The similarities between the chemical structures of psilocybin, LSD and the neurotransmitter 5-hydroxytryptamine (5-HT, serotonin) were certainly obvious as were the hallucinogenic effects they produced, suggesting that they shared the same mechanism of action. 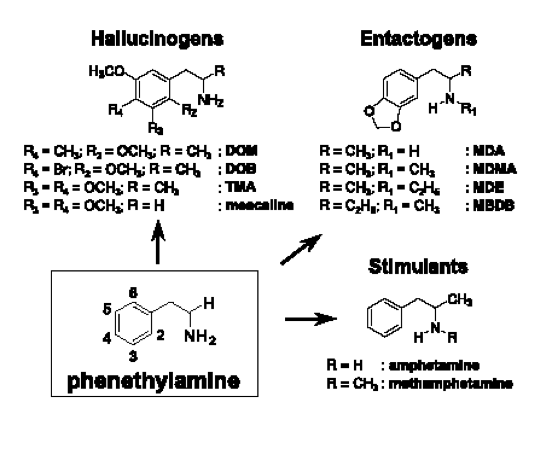 N,N-dimethyltryptamine (DMT) ,the active principle of ayahuasca, a hallucinogenic tea used by Peruvian Indians, also has a similar chemical structure. Indeed, it was later determined that the major target in the brain for hallucinogenic drugs of this type is activation of the 5-HT2‘A receptor, one of the fourteen receptors known to mediate the neurotransmitter actions of 5-HT (Fig. 3). Fig 3. The chemical structure of the neurotransmitter 5-hydroxytryptamine (serotonin) and the hallucinogenic drugs LSD, psilocybin and DMT. One of the people who read Wasson’s article was a young Harvard psychology professor named Timothy Leary. In 1960 Leary visited Mexico on vacation and tried psilocybin for himself. Impressed with its effects, he returned to Harvard and made the drug the centerpiece of his research program. A couple of years later he was introduced to LSD and also incorporated its use into his studies. Eventually Leary’s activities resulted in his being fired by Harvard. Leary went off on his own and founded a private research institute for studying the use of psychedelics. He introduced LSD to several famous people and evangelized widely on behalf the drug. However, in spite of the fact that some psychiatrists and individuals like Leary had become aware of LSD, they were not interested in making it part of a mass cultural movement. So, how was it that a few years later hundreds of thousands of people in San Francisco and in other parts of the world were taking it? For this to happen there had to be a large amount of LSD readily available and easily accessible to everybody. Strangely, that is actually what happened, something that was ultimately due to the actions of the U.S. government and the CIA in particular. their knowledge, in an effort to “brainwash” them as illustrated in the famous movie “The Manchurian Candidate”. The CIA also funded some clinical studies in which they gave different hallucinogenic drugs to paid volunteers and recorded their responses. A series of such studies took place in the VA hospital in Menlo Park, near the campus of Stanford University. One of the people who participated in these studies was a young student from the Stanford University creative writing program called Ken Kesey. Kesey was given a variety of drugs including LSD, psilocybin, mescaline, α-methyltryptamine (the indole equivalent of amphetamine) and Ditran (Fig 4). All of these drugs produce hallucinogenic effects which are similar to those produced by LSD with the exception of Ditran, which has a completely different mechanism of action. Ditran produces its effects by blocking muscarinic receptors in the brain, which are normally activated by the neurotransmitter acetylcholine. In fact, antimuscarinic agents also produce a variety of disorienting, incapacitating, hallucinatory effects, but they are very different in character to those produced by drugs like LSD. The CIA would eventually experiment with unbelievably potent antimuscarinic agents such as the drug 3-Quinuclidinyl benzilate (QNB or “Buzz”) which could be aerosolized and knock out hundreds or thousands of people at once. The volunteers like Kesey at Menlo Park didn’t like Ditran, although drugs like LSD were popular and Kesey was greatly influenced by his experiences taking the drug. By chance, Kesey subsequently went on to work in a mental hospital where he was able to closely observe the behavior of psychotic patients. Together with his drug experiences ,this inspired him to write his first novel “One Flew Over the Cuckoo’s Nest”, a resounding critical and popular success. In truth, Kesey was an extraordinarily talented writer and his two major novels (the other one was “Sometimes a Great Notion”) marked him out as one of the great hopes of contemporary American literature at the time. A career as a famous author seemed a certainty. But Kesey had other ideas. He believed that his experiences with LSD had liberated him from the shackles of bourgeois society and he developed a messianic idea that he would spread the good news to the whole of mankind. He was convinced that an LSD-fueled society would represent a great step forward for the human race. A charismatic person, Kesey soon collected a group of like-minded acolytes who lived with him, really the first hippie commune. He used the funds he had earned from his first novel to buy a large house in the woods of La Honda, about 50 miles from San Francisco ,where they would all live and take drugs whenever they liked. 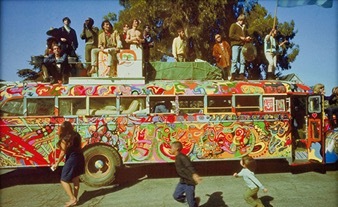 The group became known as The Merry Pranksters. Kesey was a truly radical person and lived as close to the edge as was humanly possible, sharing his drugs with his friends and other marginal groups such as the Hell’s Angels. But how to really spread the word? The first thing Kesey did was to buy was an old 1939 bus that he renovated and painted Day-Glo colors. Then, together with 14 of the Merry Pranksters, he drove across the whole of the USA giving out LSD and talking to anybody who would listen about the liberating properties of the drug (Fig. 5). The Pranksters then visited Timothy Leary and his group who had settled in the Millbrook Estate in upstate New York, home of the wealthy businessman “Billy” Hitchcock, a member of the wealthy Mellon family, before driving back to La Honda. Fig 5. The Merry Pranksters. Kesey next planned to hold a number of events where he would freely distribute LSD, accompanied by the latest rock music played by bands such as the newly formed Grateful Dead, with the intention of turning on thousands of people at a time. But where would he get such a large amount of LSD? It was time for Kesey to meet another legendary character who was a key figure in the emerging San Francisco hippie movement. This was a man called Augustus Owsley Stanley, scion of an old Kentucky family, who had enrolled as a student at Berkley in 1963. At some point he tried LSD and decided that making and selling it was what he really wanted to do. So, along with a chemistry student named Melissa Cargill, he dropped out of Berkley and started figuring out how he could manufacture large amounts of acid, something that was still legal at the time. One thing to remember about LSD is that it is an extremely potent drug, 250 micrograms being a reasonable dose for most people. This means that a little LSD goes a long way. Soon Owsley Stanley had figured out a synthesis and manufactured several hundred thousand doses of very pure LSD. Stanley moved his LSD manufacturing operation around starting in Berkley and then at points setting it up in Los Angeles and Denver prior to returning to Berkley once more. Much of the LSD was passed along to Ken Kesey who used it to fuel his “Acid Tests”, advertised using the question “Can you pass the acid test?”, huge LSD inspired rock concerts held primarily in and around the San Francisco area. One of the earliest of these events was the Trips Festival, a riotous and extremely anarchic 3-day event held in January 1966 where participants could help themselves to Kool Aid liberally laced with LSD (Fig. 6). The entire scene was starting to coalesce around the Haight-Ashbury area just next to the pan handle of Golden Gate park. This was an area with old somewhat rundown Victorian houses with low rents where bohemians, artists and political radicals began to settle in the early 1960s. By 1965 the area had become a crucible where all of the diverse influences of the time were finally mixed together. Lots of extremely pure LSD was readily available on the streets at very low prices thanks to Owsley Stanley. Artists were available to transfer the LSD experience into a new aesthetic. Poster artists like Victor Moscoso, Rick Griffin and Wes Wilson turned Haight-Ashbury into a psychedelic diorama. And ,of course, there were many emerging rock bands with a new sound that captured the characteristics of the LSD trip. Colorful hippie fashions created a unique style-Peace, Love and Flowers in your hair. Not to be downplayed was the fact that from the very beginning there was a commercial aspect that helped hold everything together. The music promoter Bill Graham, an extremely savvy business man and no hippie, quickly saw the potential of the entire scene and enabled many of the elements to be actualized as real performances. By the time 1967 dawned the entire hippie movement in Haight-Ashbury had blossomed into something that had completely energized the whole of San Francisco and was ready to burst out into the rest of the world. One of the peaks of the entire phenomenon was the Monterey Rock Festival in 1967 which played host to many of the famous rock bands of the time who performed in front of a gigantic audience numbering many tens of thousands. Owsley Stanley , who used to create a new set of appropriately colored LSD tabs tailored to go with different events, created “Monterey Purple” to go with the Monterey Rock Festival. But it couldn’t last. In October 1966 LSD manufacture and possession became illegal in California and Nevada. In 1968, the U.S. government made possession of LSD for recreational use a crime. In 1970, the U.S. Congress passed what is now known as the Controlled Substances Act. Under that law, LSD became a “Schedule I” (most severely restricted) drug. Schedule I drugs are those that the government has deemed dangerous and without any accepted medical use. As a Schedule I drug, possession, manufacture, and distribution of any amount of LSD for any purpose became illegal in the U.S.A. Even bona fide scientific research with the drug became impossible. Cannabis was already illegal at this time with heavy penalties for its possession and use. People like Ken Kesey and Owsley Stanley were busted for LSD and/or marijuana possession and spent time in prison. That wasn’t the end of the story, however. The business of making LSD continued with Stanley’s colleagues Tim Scully and Nick Sand (who died this year) producing the largest batch yet. 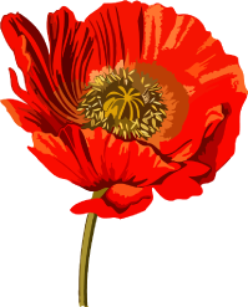 This was the famous “Orange Sunshine” which is said to have yielded over 3 million doses of LSD and was distributed all over the world including to American troops on active service in Vietnam. Scully was eventually busted and went to jail, whereas Sand escaped to Canada where he lived as a fugitive for 20 years before being captured. Although LSD was the primary hallucinogenic drug used on the streets during the 1960s, other hallucinogens were available as well. One of the major texts of the psychedelic movement was the book “The Doors of Perception” by Aldous Huxley who described his experiences taking the hallucinogenic drug mescaline which comes from the cactus Lophophora Williamsii, also known as peyote. Like psilocybin mescaline is also used by American tribal peoples in religious ceremonies. Mescaline, particularly in the form of peyote buttons, was available in California in the 1960s, although it was never as popular as LSD. However, mescaline produced its own interesting story. A great deal of outstanding chemical and pharmacological research on mescaline and its derivatives was performed in the 1960s and 1970s by Alexander Shulgin. Shulgin was a Harvard trained chemist who eventually ended up working in the chemical industry where he invented a highly profitable insecticide. At some point however he took mescaline and became fascinated by its effects. He then began a detailed investigation as to how alterations in the chemical structure of mescaline affected its hallucinogenic properties. Mescaline is different from the other classical hallucinogens because, although it produces similar effects, it isn’t built around an indole nucleus like LSD, psilocybin and DMT–rather it is a phenethylamine derivative, closer in structure to psychostimulants like amphetamine (Figs. 7 and 8). Shulgin began to make alterations to the substituents on the benzene ring of mescaline and produced molecules with much more potent hallucinogenic activity. One of the first molecules of this type that he synthesized was DOM (2,5-dimethoxy-4-methylamphetamine) (Fig. 7) which he synthesized in 1963 when he placed a methyl group at the 4 position of the benzene ring. As he describes in his book PIHKAL (Phenethylamines I Have Known And Loved-an indispensable text for anybody interested in this topic) when he tested the drug on himself he found that doses as low as 1milligram produced hallucinogenic effects. This is much lower than the effective dose required when taking mescaline, to which DOM is structurally related. Shulgin would later observe that replacing the methyl group at the 4 position on the benzene ring with either bromine or iodine produced even more potent hallucinogens. Although the synthesis and properties of DOM weren’t published in the scientific literature until later, Shulgin did talk about his discovery at university seminars including one he gave at Johns Hopkins. At any rate, information about the properties of DOM did become available to the public. At one point in 1967 the raw materials for making LSD were in short supply. So Owsley Stanley and his colleagues decided to try making DOM instead. Once the DOM had been successfully synthesized it was formulated as 20 milligram tablets and sold on the streets in and around Haight-Ashbury under the name STP (Serenity, Tranquility and Peace). The result was a complete catastrophe. Given the fact that DOM is a potent hallucinogen active in doses of around 1 milligram, the 20 milligram tabs were way too strong. The hospitals in San Francisco were suddenly full of people who were psychologically incapacitated. The STP was rapidly withdrawn from circulation. Shulgin’s research went on to show that the simple phenethylamine nucleus could be easily modified to produce several different types of drugs. The small modifications that yield psychostimulants such as amphetamine and methamphetamine had been known for many years. As we have seen, some substituents, like those found in DOM, produce powerful hallucinogens rather than amphetamine-like psychostimulant activity. Additionally, Shulgin also demonstrated that addition of a methylenedioxy modification to produce MDMA (methylenedioxy methamphetamine) resulting in a drug with a third type of activity. Such drugs have been called “entactogens”. MDMA has become a widely used street drug known as Ecstasy. It is certainly extremely fascinating that such small differences in chemical structure can produce drugs with such widely ranging psychological effects (Fig 8). The LSD fueled social experiment that took place in Haight-Ashbury reached its apogee in the years 1966 and 1967.After that the happenings in the area started to attract international attention. Press hysteria, an influx of hardened criminals and hard drugs, and the arrival of streams of tourists and wannabe hippies began to put pressure on the situation which slowly descended into a tawdry fun fair. LSD and related drugs were now illegal and their use began to decline. Gradually hallucinogens went into eclipse. It is quite clear that hallucinogenic drugs like LSD have truly profound effects on the process of human consciousness. Very few people who have taken the drug would disagree with this conclusion, whatever their social, economic or political background. It seems to me that drugs like LSD might well have a bona fide place as important therapeutic agents. This was realized soon after the drug was introduced and, as we have seen, led to numerous studies by psychiatrists in the 1950s and 1960s, many of which were very promising. But for 50 years, access to hallucinogenic drugs has been so restricted that research on this topic has virtually ceased. Over the last decade, however, there have been signs of a revival. Nowadays techniques like imaging the activity of the human brain have started to reveal the neural substrates of hallucinogenic activity. It is time for the constraints to be relaxed and for the government to allow reasonable access to drugs like LSD for different types of experimentation so that they can take their rightful place in investigations of the human psyche.